A quick question: where are you reading this post from – your home office, work or slouching on the couch with your laptop? Would you believe if I told you that I do most of the work from my dining table ? That’s right. Got to get my own reading corner in the house, so I was just thinking of some simple ideas. And, one seemed perfect. There’s a small L shaped corner in the extra bedroom that fits in perfectly for the purpose. 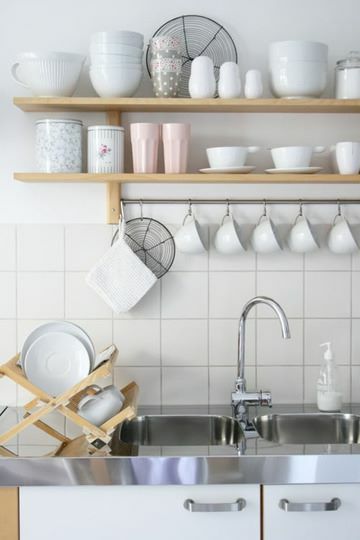 But, before I go there, I would like to ask you what’s the one thing you love the most about this picture (sorry folks, the white dishes don’t count for an answer)? I know I know, I too LOVE them – anything white for that matter! I like the floating shelves in natural wood. And I think this will work best above my desk – two open shelves, that is. What I have in mind is something like this or even plain shelf. 1. Get a carpenter to cut a plank of 4ft *1ft dimension and fix three screws at the back. I’m not sure if it will be able to take the weight or if it would need L angles. 2. If it doesn’t need L angles, I can do it myself and fit it in the wall. Saves some time of finding a carpenter for a small job. 3. Get it ready made and fix it. The only drawback with this option (other than it being expensive) is you wouldn’t get the wood stain of your choice. One place where I found something closest to what I have in mind is Fab Furnish. Surprisingly, Urban Ladder doesn’t have simple open shelves. I believe there is a special hardware for installing the floating shelves. This is something that I read and so am not so sure about it. The three screws that you are referring to will be half inside the plank and half inside the wall ? If so am thinking how it will get installed and if it can really bear the load. Having a reaper below the shelf is what I commonly see. 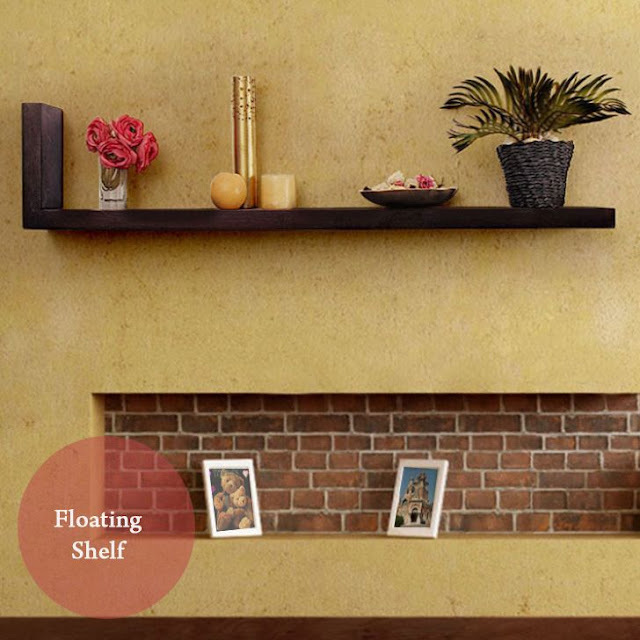 Though it takes the fun out of the floating shelf look, it gives a near floating look. Elegant looking L angles are really nice. I have 2 pairs which I have not been able to use. Do let me know how you manage to install the shelf. It would be a good DIY learning. I have actually used four of these on a criss-cross shelf earlier – forget the name (let me also browse thr my pics folder to see if I can post one). Depending on the load, you can use one with two screws on the wood and one on the wall, or one on the wood and one on the wall (actually you can see the backside of shelves on Fabfurnish image to see what I mean). My only concern is if it will be able to take the load of books. Since I won’t b stacking very heavy ones, I think it will do fine. And three screws over four feet, will be a good support system. BTW, where in bangalore, can you get the wood stained to your requirement? Thanks Manasa. That was useful..I didn’t know Fab India stored such utility furniture pieces as well. I think it depends on how many screws you have for that kind of length and how short spaced they are. 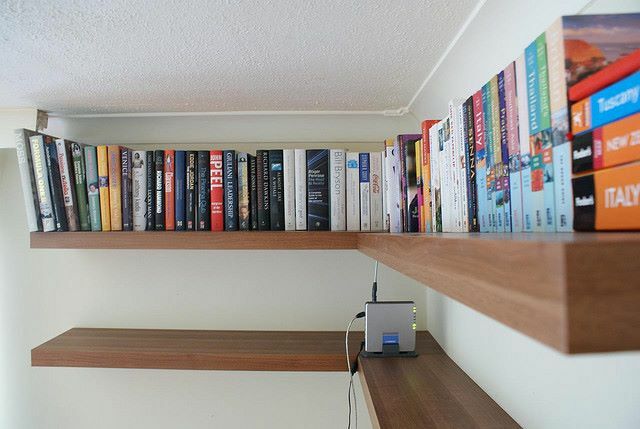 The picture I was referring to are the last two ones in this post – http://www.dressyourhome.in/2009/07/06/thrifty-idea-cd-and-book-rack/. This one used such racks and could take very heavy load – over hundreds of CDs and a dozen books at one point all with those screws. Stained wood – not sure. Will find out and let you know. Also staining can be done by any polisher/ carpenter. The wood needs to be stained with a stain powder/stainer that’s available in any hardware store and then spray polished (melamine matt )with a machine. True, Renu on the width and staining part. But, the smell of the melamine stain is not something novices like me can handle. It’s too strong and needs to be done with care. I think what works best is when you get a big carpentry work done, keep the remaining planks and they come in handy for uses like this. I’d prefer rubber wood for its natural stain but it can’t take weight unless supported at the bottom with a ply.